Hey guys! 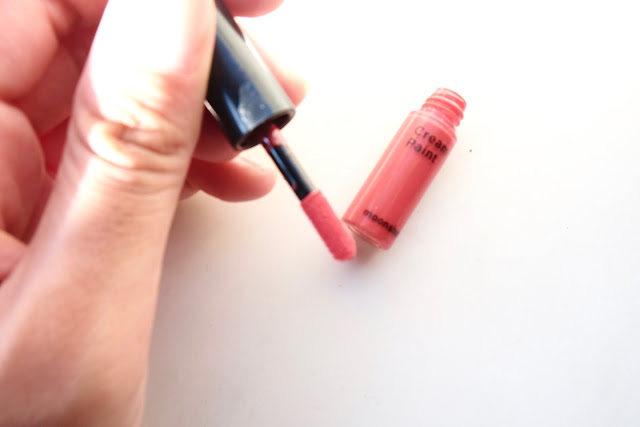 Its been long overdue, but Moonshot Cosmetics has finally touched down Sephora MY - and they have been receiving a lot of buzz since their initial launch, we see it on the stands, but what are the hidden gems within the brand? 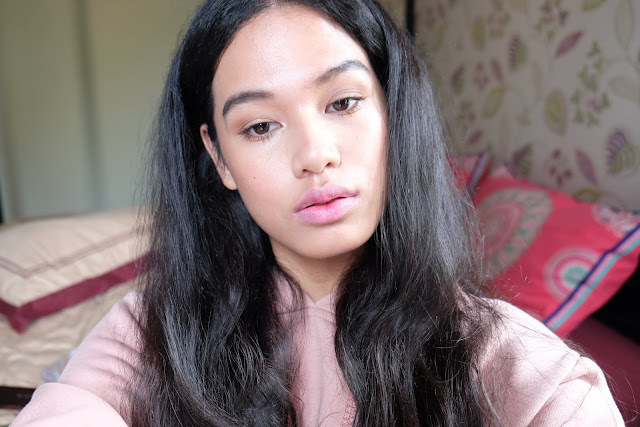 For me personally, trying out Korean makeup can be quite confusing at times as there aren't a lot of thorough or helpful reviews online, and theres's little product information as it's all written in Korean! - so in the end, I have to physically go to the stores to swatch and try the products itself. 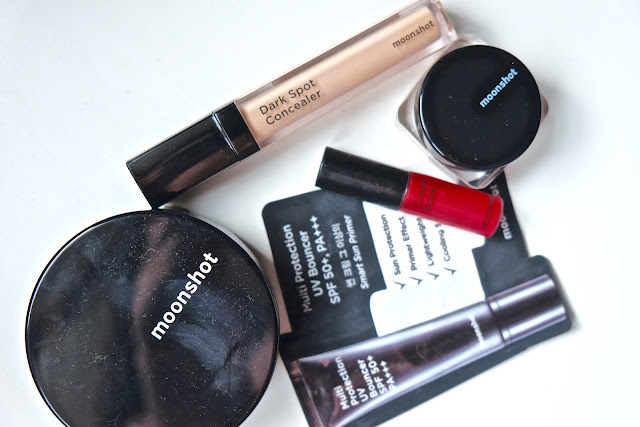 Hence, I hope this review will help you guys get a little idea of Moonshot Cosmetics and their products. So, if you are die-hard fans of Big Bang and K-Pop music industry, you'll probably heard of the record label called YG Entertainment. They've decided to slay the makeup game by partnering with Korean's best R&D team, COSON Group to come up with an individualistic, interesting makeup line - and it represents their niche of eccentric and trendy style really well. I mean, look at Sandara Park and G-Dragon, who are their spokesperson for their new Cushion makeup range - nothing about them screams "bland"! I was invited to their Sephora My launch for their Microfit Cushion and yes, I got to meet DARA! She was so lovely to all her fans and it was really unfortunate that she only got to stay for 20 minutes due to the traffic she was caught in on her way to the event. I know, bummer! But the launching was so awesome as they brought the Moonshot makeup artists, or Moonshot Boys, over to the launch! I got to do a makeover with them as well. The Moonshot boys were really amazing and friendly and had made the whole launch event much more fun! They even took photos with by-standing fans. So cute. This is marketed as a primer, or base by most of the makeup artists from Moonshot. So, from what I can say is this acts like your transition step - right after skincare and right before makeup. It feels like a hybrid of a lotion and a gel, and it sinks into the skin quite fast but leaves a film of smoothness onto the skin like a primer would. It has a very lightweight texture, so I'm assuming it is more of a chemical sunblock rather than a physical sunblock which are more creamy and heavy. It has a very strong cucumber fragrance to it which I don't really like, but to be completely honest, it does help with the wear of my makeup! I went shopping immediately after I've done my 100% Moonshot makeup, and I've noticed that my mascara didn't smudge, and the Moonshot Cream Paint did not melt off my skin! So kudos to that. Although, I still won't replace my sunscreen with this - but it is a good option if you don't use any kind of sun protection in the first place. It has a slight tackiness to it which helps in applying concealer and foundation and doesn't leave the skin looking too oily or too matte. Just a very nice satin matte finish. The full size bottle comes in an opaque black tube with a pump, so the ingredients are preserved very well and you can stretch out the expiration date longer. Nice! Okay, so this is the sucker that everybody went crazy about. Since the promotional videos and campaign shoots are heavily promoted with G-Dragon for the Microfit Cushion and Sandara for the Moonflash Cushion (a highlighting base), I get a bit sceptical with this as it was a bit hyped up - but is it really worth the hype? So, lets just forget about the hotness of GD for a second and focus on the product itself for a second. 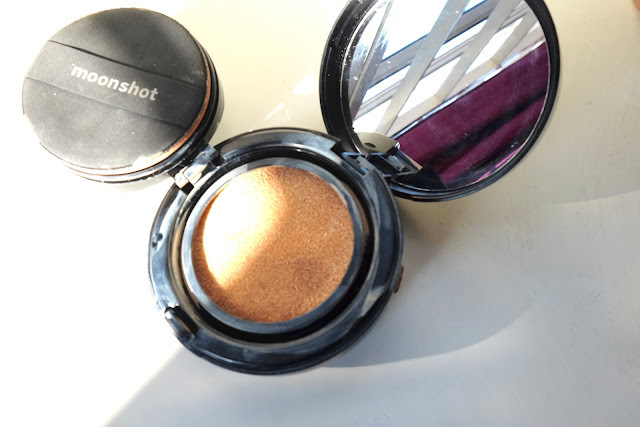 I had very high hopes with this cushion foundation because I was looking for a dewy base and something light to lug around on the go, so a compact cushion foundation seems the way to go, am I right? 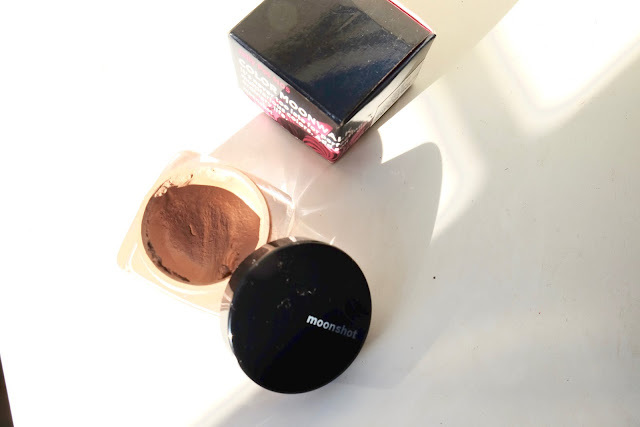 If you're not sure what a cushion foundation is, it is basically a compact like your usual powder compact but it houses the liquid foundation in an antibacterial sponge which you then gently pat with the antibacterial puff and pat it onto the complexion. For the Moonshot Microfit Cushion, the packaging feels a little bit cheap for me but it is very lightweight so it is a good option in a sense because I hate the feeling of carrying heavy handbags from all the makeup I lug around. As for the coverage, and texture, it feels very hydrating and cooling on the skin and sets into a powdery finish - which a lot of Korean bases tend to have. Personally, I do not like the powdery finish as I prefer something a bit more dewy. But I guess that is why there is a Moonflash Cushion which would probably go well patted on top of the Microfit Cushion to give a more dewy effect. It has sheer-medium coverage but it is very buildable to get a more fuller effect, so it's very flexible with the coverage. What I like about the Microfit Cushion is that it doesn't feel heavy at all, which is really what you want when you're in a tropical country like Malaysia. The only (and fatal) downside of this product is probably the shade range, as it only carries shade 101 and 301 which are more of a cooler pink undertone shade, and shade 201 which has an olive/warmer undertone to it. And that's it. Three shades. The one I have at hand is in the shade 101 which is too light for me, hence I have only swatched it for you guys in the picture below. You can see that it leaves a grey tinge to my skin as it is too light for me and it has an "anti-darkening formula" which basically translates to having whitening properties to the formula. If you are familiar with whitening products, you would know that it leaves an unnatural looking "white cast" behind if you're a medium-tan skin. So I'd recommend to swatch the shade 201 in-stores for medium-tan skin gals. 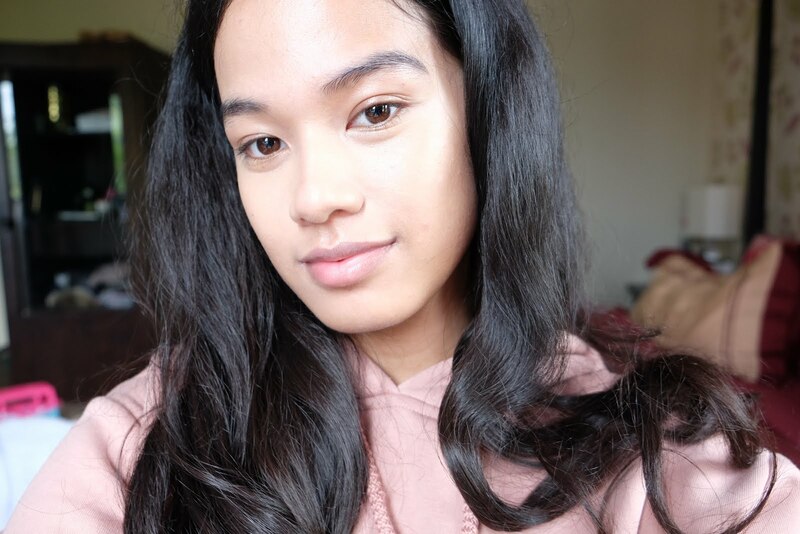 When used sheerly or really well-blended into the skin, the shade 101 is not too awful I must say, I can work with it by adding in a cream bronzer on the outer perimeters of my face or mixing in a drop of darker foundations I have at hand. I'm actually interested in their three other foundations, which are the Face Perfecting ranges - they carry it in a Balm, Liquid and Stick. They do have a wider shade range for those, so chances are it will be a better match for my skin from the Microfit Cushions. Oh this concealer! I loveeeee it. I was running out of my Diorskin Star concealer which is my faaaaavourite concealer of 2015/2016, and I've decided to pick this up at Sephora Avenue K. So, when you purchase two of Moonshot products, you get a free miniature Cream Paint, which is awesome because I wanted to try those too without committing to the full size. Okay, this concealer comes in a really sleek packaging, reminiscent of the Nars Radiant Creamy Concealers, I must say.. (even the consistency!) and the doe-foot applicator is just the right-size for my undereye concealing needs. 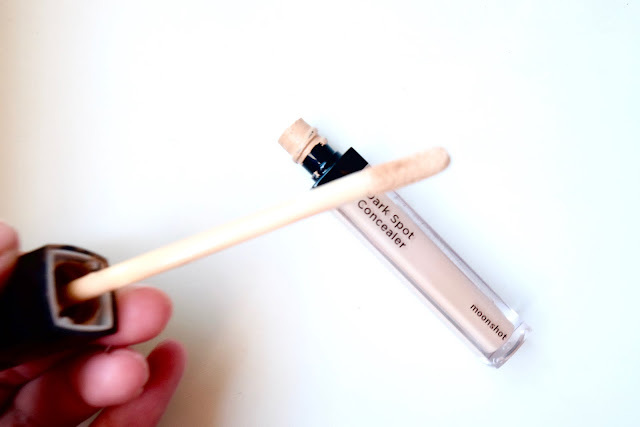 For the Dark Spot Concealers, what I noticed is that the second ingredient for this product is Titanium Dioxide which is probably what it meant when it has an-anti darkening formula (same as the Microfit Cushion). Shade 301 is a medium-beige tone concealer with peachier undertones so it works really well in brightening up sallow skin. I really like to focus the product on the under eye and work it in with the beauty blender and dabbing the excess onto the outer perimeters of the face. It has a really high coverage, and you only need a little to cover a lot! The texture of these are more creamy and glides on to the skin so well without gripping any dry patches on the skin. So I can see that this will work well on a lot of skin types as it is not drying at all but at the same time, it doesn't make your skin look like an oil slick. As with the Microfit Cushion, it has a slight fragrance to it - not unbearable I actually kinda like it, but once you've blended it into the skin the fragrance sort of disappears after a while. I do like using this mixed in with a glowing primer, like the Becca Shimmering Skin Perfector or the Dior Glow Maximiser, kind of like creating my own CC Cream. I really love the concealer to cover the under eye and it works quite well on dark spots as it claims. But for extra coverage, leave it on for a hot minute before going to blend it out so that it sets a little and doesn't move around too much. It gives the skin that glowy type of finish that I expected the Microfit Cushion to have, so in all honesty I'd rather you get this than the Microfit if you want a bang for your buck. I find that I did not need to set the concealer when I was going out, and it still remained intact on the skin. 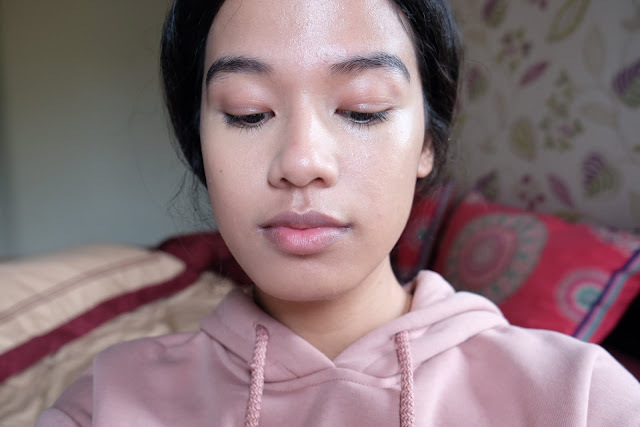 If you do a thick layer or add another layer onto the skin, you can visibly see that it becomes slightly powdery looking so a little bit goes a long way! Okay, so the shade that I got was M05 Cocoa Fondue which is taupe-dusty pink shade. It looks so gorgeous as a contour shade on the eyelids, even on the face actually (I've tried it before!) as it runs cool-toned and provides a subtle shading to the eyes without looking overdone. Anyway, the texture of these jelly pots are very liquidy and runny, so it is advisable for you to use either your fingers to apply and blend or a synthetic brush. The thing about this product is that it comes in a jar and the jar is quite wide and shallow which means that air seeps into the product and dry it out! Boohoo. I've had this for less than six months, and you can tell from the photo that its already starting to become more powdery. I suppose it will be the same case for their shimmers as well. The shade itself is so pretty so it is unfortunate that the product dries out so quickly. The Jelly Pots do set quickly so once you've applied it onto the eyelids, blending can be quite trying! I suppose the shimmers will be more forgiving as you do not need to be too precise with the pearl finishes. I do find that it creases a lot as well if I try to layer it for more pigmentation, as MO5 Cocoa Fondue slacks in the pigment department. It sets into a powdery finish which is good for my oily lids but I do need to work in thin layers to avoid any creasing and cake up with these. The one I have is the miniature size of the Cream Paint, where the doe foot applicator varies between the miniature and the full size. In the full size version, you get an oddly large round applicator which in my personal opinion is a packaging flaw, as it is too large to get a precise line for application on the lips. I prefer the applicator on the miniature version in my opinion. Although, packaging aside, the product itself is amazing! The shade that I have at hand is in Dragon Fruit, and it precisely looks like a dragon fruit! A pinkish red cream with a cool undertone (makes your teeth look whiter!). It leans more on the pink side. This product, as with the Jelly Pots, are marketed as multi-use makeup, so be creative! I can see that this would make an interesting product to be used as an eye gloss too because it does have a slightly glossy finish that I love in a cream product! The Cream Paint is so pigmented, that when used as a blush, one tiny dot is enough for the product to show up on the skin. I absolutely adore this colour when used as a blush because it livens up the face in the most natural way but I like to layer it so that it gives a more intense look. Lately I've been into the pop of blush look.. so bear with me hahahaha. This babies, albeit being creamy and hydrating, has a slight tackiness to it which helps with the product being long-lasting! 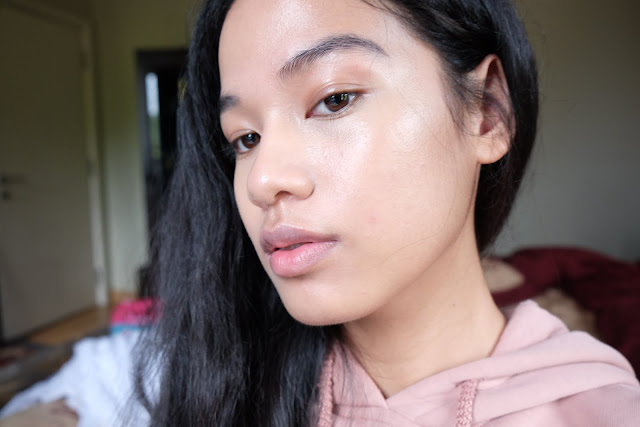 I wore this out for I think more than 6 hours and the pigmentation of Dragon Fruit lasted through the day, on both the cheeks and lips. I like that you will be able to manoeuvre the intensity of the look you're going for, just put a dot on the centre of the lips and blend for a sheer wash of colour - or, glide the applicator on your lips for an intense colour. Quick and easy. The colour ranges of the Cream Paint is wonderful, too. They have lilacs, oranges, pinks, reds, even a blue one! Go ham. Check them out at Sephora. Other than that, I'd say texture-wise, it does not feel like a lightweight cream when you first apply it, but once blended you don't feel it on your skin. I think the Cream Paints are a must-have from Moonshot. It does claim to set into a powdery finish, but I find that it sets - doesn't look powdery at all. It's a good thing. Glow! Look at how even the skin looks, I love it. Cocoa Fondue on the lids, and Dragon Fruit on the lips and cheeks. 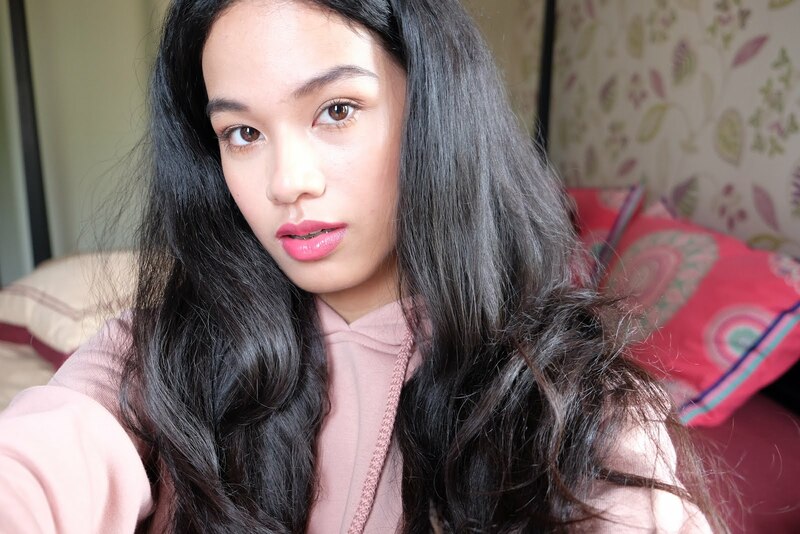 Dragon Fruit + concealer to give my makeup the signature Korean ombre lips effect. I actually like how it looks and chose this option to wear out to go shopping later that day. And that is it! In a nutshell, Moonshot Cosmetics has a very unique range of products that do perform well and not just be construed as gimmicky. In particular, I really fell in love with the Cream Paints and Dark Spot Concealer! If you feel like trying out this brand, I suggest to start with those two or you can substitute the Concealer for any products from their Face Perfecting range. I will be picking up the Face Perfecting Balm next. Overall, I do like their Color Makeup, and the Jelly Pots, they even have a G-range which are Glitter finishes! I just hate that it dries up so quickly tho! So frustrating. I hope Moonshot will come up with new innovative products in the future! I have high hopes for this brand. Their aesthetics, and bold products just really have won me over. There are a few duds regarding the shade ranges and "anti-darkness formula" with the Microfit Cushion just doesn't quite.. fit. Let me know what are your favourites and not-so favourites from the brand in the comments down below, and thank you for hanging out!